This is the first of many posts, which will detail unusual finds, the day to day goings on and the people, customers and projects and restorations involved in this business. – this is the Drew Pritchard Antique’s look. Drew's undying passion for the old, rare and beautiful began at a young age. His career started at 16 when he began a seven year stained glass restorer’s apprenticeship. He knew from the first day on the job that he had found his calling. Working on restoration, conservation and commission jobs in this country and abroad for interior designers, property developers, hotel and restaurant groups; his eye and look was allowed to develop. So once leaving after his seven years, he was immediately inundated with requests for his restoration skills, and for architectural and decorative pieces. Selling predominately to the trade nationally and internationally, Drew is always happy to deal with the trade large or small. Many of you may have seen Drew star in the 2005 BBC2 series “The Reclaimers”. This was a funky in-depth look at the goings on day to day at salvage yards across the UK. Upwards of three million people watched each episode. The filming took almost a year and charted the constant search Drew has to find our ever changing stock. Drew even managed to sell the Director a window for his own house! Click here for a trailer for the series. Drew’s passion is evident in his extensive showroom – some would call it his toy box (20,000 square feet!) - in Glan Conwy, North Wales. This is not just a salvage yard; we believe we have created a whole new category – decorative salvage. Open seven days a week, and with a constantly changing stock, this is no lazy antique shop. A constant stream of stock is arriving for the gentle restoration process. Whether it’s a £20 door knob, or a £20,000 restored fireplace, our enthusiasm is bound to rub off on you. Drew's love for old world glamour has allowed him to experience some truly amazing antiques and his show room allows you to come and experience them for yourself. His specialist in-house team of restorers share drew's enthusiasm, and can carry out a huge variety of skills enabling them to restore items to their former glory. This service is available to private and trade customers. Most pieces are unique and the stock changes so fast, we always say "when you see it buy it" . 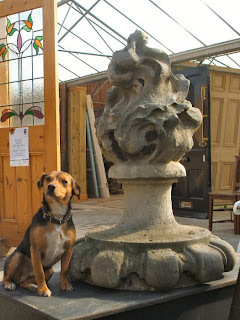 We stock a vast array of reclaimed goods, ranging from everyday items like floorboards, beams, quarry tiles and doors, to character pieces like chandeliers, ecclesiastical remnants and fireplaces, panelling, statuary, urns, country furniture and leather chairs. The showroom boasts one of the most impressive selections of stained glass and leaded panels available in this country. In addition, we design and manufacture a bespoke stained glass door range and also carry exclusively for Wales and North West, a number of quality reproduction ranges. "Have nothing in your house you do not know to be useful or believe to be beautiful"
is the William Morris Motto that inspires the company and is a rule by which we all live. We hope you will come and visit us.